Android Nougat is now on 4.9 percent of all devices - AndroGuider | One Stop For The Techy You! 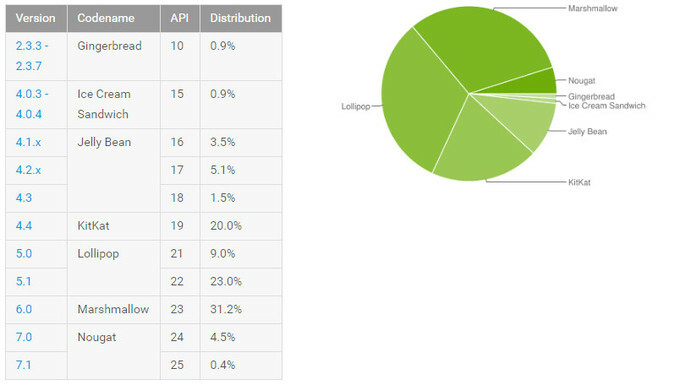 Google has released the Android Distribution stats for the month of April. The data was compiled from Android devices that accessed the Play Store in a seven-day period ending on April 3. As per the latest data, Nougat had a strong growth, jumping to 4.9 percent from March's 2.4 percent, a growth of 2.5 percent. More specifically, Android Nougat (v7.0) had a share of 4.5 percent, while 7.1 stayed at 0.4 percent, same as last month. Marshmallow had 31.2 percent share of the pie, but had a slight drop of 0.1 percent from last month. Android Lollipop still dominated with a total share of 32 percent, a drop of 0.5 percent compared to last month. The out dated Android operating system including Android KitKat was present in 20 percent of Android devices and Jelly Bean at 10.1 percent. Meanwhile, Ice Cream Sandwich and Gingerbread have 0.9 percent share of the pie. Android Nougat will continue to increase in the coming months, as more devices will be getting the update soon. Moreover, the roll out of new Android Nougat phones will also contribute to the growth. The next major release of Android is O. The Pixel maker recently rolled out the first developer preview of the latest iteration.